Welcome to our Weber Performer Grill review. 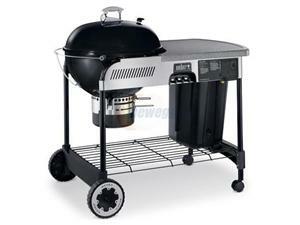 We will have an in depth look at the useful features of this Weber Performer charcoal grill. 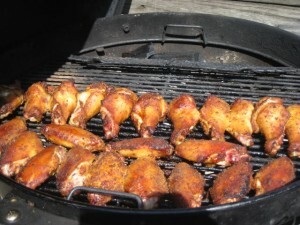 Some people will say that the only way to cook food on a grill is to use charcoal and not gas. So, if you love and prefer the flavor of charcoal grilled food then Weber Performer grills are for you. We’ve researched the Weber Performer bbq fully so you can see all the reasons why this particular Weber model is proving so popular. We’ll also take a look at the various editions of the Weber Performer grills, looking at current and previous models so you can find a Weber performer grill on sale at a price that works for you. Unlike most of the Weber grills which use gas as its heat source, the Weber Performer Touch-N-Go Charcoal Grill uses charcoal or wood, giving you that authentic / retro flavor to your cooking. The Weber Performer bbq is effectively a traditional style charcoal grill and was clearly designed to be as convenient and easy-to-use as one of Weber’s hugely popular and versatile gas grill models. Like other charcoal grills on the market the Weber Performer grill is dead easy to use but a lot cleaner than you’re probably used to when using charcoal as a heat source…..and a LOT more convenient. 3….2….1…lift off… the Weber Performer Charcoal Grill makes lighting the fuel simple – really simple! 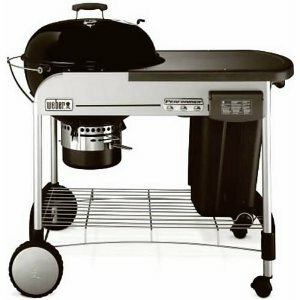 It’s as simple as this….. All you do is pour in the charcoal to fill the kettle bottom, turn on the gas assisted Touch-N-Go charcoal grill lighter system, push the automatic igniter button (which ignites the gas) and in approximately 10 minutes you’re ready to grill without ever having to use lighter fluid or matches. No more placing firelighters amongst those messy charcoal bricks, and you can put that box of matches away too! 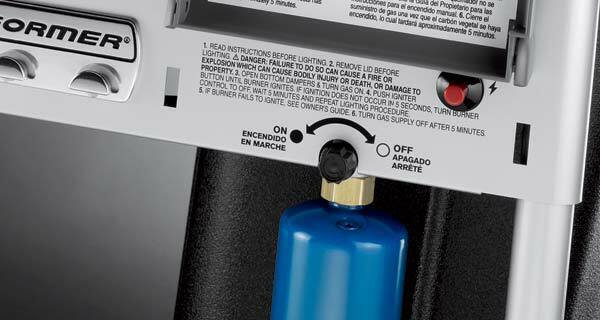 The Weber Touch-N-Go Grill ignition system is fuelled by 14.1 or 16.4 ounce gas bottles. Weber indicates you can expect up to twelve 10 minute ignitions out of one bottle, and so you might want to note that you will need to buy replacement gas bottles every now and again to keep the ignition system running. The Weber engineers have incorporated a storage bucket for your charcoal within the grill. The bucket protects your fuel from being exposed to the weather elements throughout the year. No more dancing around those half opened charcoal bags! The earlier models of the performer grill required the preparation surface next to the cooking area to be lifted to gain access to the charcoal which was quite inconvenient, but the engineers have now re-engineered the current model meaning this is no longer a problem. Need to top up with charcoal while you are grilling? No problem – the Weber Performer team have placed hinges in the steel grilling grate, allowing you to flip it up and top up your charcoal into the kettle while you have food on the go. 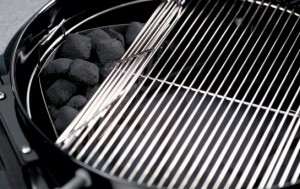 The burning charcoal is housed within what what Weber describes as two “Char Baskets”. These baskets are effectively two separate charcoal buckets which provides extra flexibility on the amount of charcoal exposed to be burnt. Space for cooking, space for preparation, and still there’s even more space…! The Weber Performer grill comes with a large cooking area, with an equally large lid cover that helps to keep all that charcoal cooking smoke inside to get provide that really authentic smoked taste. The grilling surface is 22.5 inches diameter, that’s 397 square inches cooking space which is enough for a lot of grilling! If that’s not enough, another thing we truly love about this charcoal grill is the amount of table space you get with it. 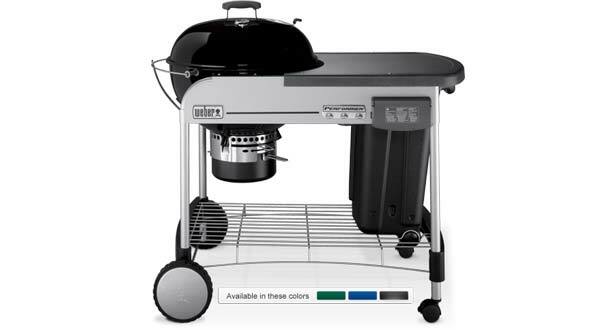 In fact, the Weber Performer Charcoal Grill’s large preparation table space (in thermoset plastic) is the largest offering of all the Weber charcoal models. Having this handy space right where you need it is a great idea and well thought out. It removes the need for your own side table next to your grill. And there’s more space saving design……3 handy hooks on the front face of the grill keeps those grilling tools handy, yet out of the way while you work your grilling magic. There’s even a large wire frame shelf beneath the grill for you to put whatever you need down there. Also, the grill lid is a brilliant piece of engineering because the lid slides to the side of the grilling kettle when opened. This means the hot lid stays contained to the unit while you flip over those burgers, saving the need to find a safe place for the hot surface…. instead you can concentrate on cooking! While the lid cover is down, you can control the cooking environment through monitoring the temperature using the front facing temperature gauge, and opening or closing the rust resistant aluminum vent. 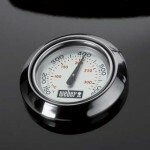 The temperature gauge is an excellent feature as it removes the guessing game from the question “is my grill temperature suitable for cooking?”. Finished cooking? But still…the Weber Performer performs! This Weber Performer grill has been designed with cleaning in mind. Does anyone like cleaning? We don’t! 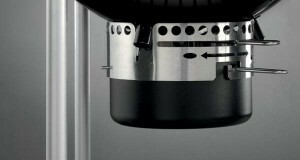 So, something we particularly love about the Weber Performer bbq is that the charcoal ashes conveniently fall into a removable ash box which is located underneath the kettle….. making it super easy to clean and maintain. When you’ve finished cooking all you do is close the air vents and the lack of oxygen quickly kills the fire and will prevent the leftover coals from burning any further. When the grill has cooled down just give it a shake. 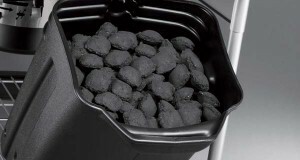 The ash falls into the ash box and the remaining coals are left behind for your next grilling masterpiece. There’s no more scraping out the ash and getting it all over your hands and clothes. Curious to see what the Performer looks like in action? Brand new – just have a look at this short video to see this beauty in action…. Now we are on the home straight…look after your investment! As is common for a grill of this size, some home construction is needed on your grill before it can be used. The enclosed instructions are backed by Weber’s telephone and email support, which is available all year round. That’s right, they have a grill line open 7 days a week together with Weber’s comprehensive website where you can order Weber Grill replacement parts or have your questions answered. How many other grill manufacturers provide all that for you? 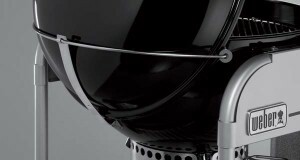 Weber has built a reputation of providing quality components inside and outside their grills. The design team has thought of most things, and even the grill stand wheels have a non crack specification and 2 locking wheel casters to keep the Performer Grill in its place. Compared to some of the previous Weber Performer grill reviews, the newer Performer models have had some of their metal surfaces/handles replaced by plastic. Some customers have commented that this material change has made the cleaning of these surfaces more difficult compared to the metal formats. The intention by changing the material has been to make the overall price of the performer grill more affordable. It is recommended that your investment in a Weber Performer Grill is protected by the use of a grill cover. 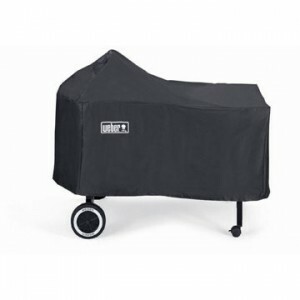 The Weber Performer Grill Cover 7455 is designed specifically to cover the performer’s unique shape, and its use can keep it protected from the outdoor weather and helps keep it looking great and ready to use all year round. The Weber Performer is essentially a 22.5 inch Weber Kettle grill for around $350. The big question being, is the added convenience worth the extra money? Well, once you’ve got to experience the Performer Grill features that make charcoal grilling easier, cleaner, and convenient you may think so. We’d have to say that the Weber performer is one of the most handy charcoal grills seen a long time. We believe that if you want a charcoal grill, and you can afford it, the Weber Performer is the best you can currently buy.